We love Him, because He first loved us (4:19). "God loves us." 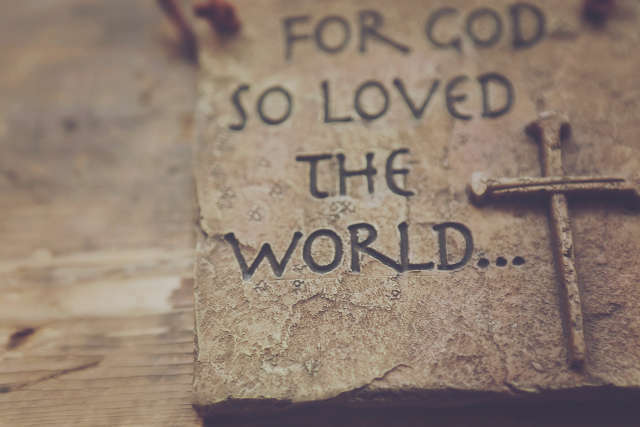 Three little monosyllabic words, but how weighty they are with significant meaning, that the great God whom the heavens of heavens cannot contain should love us. We are moved when a dog loves us, or when a baby loves us, or when a friend loves us; how much infinitely more meaningful to say that God loves us. In this big, vast world, we are so small, so tiny. Even in this city, we're a cipher; we are like a candlefly that dies before the morning sun. We are like an autumn leaf that falls unobserved to the ground. Our very planet is a speck in this infinitude of universe. How much smaller our little inconsequential lives; yet the revelation says in the Book that God loves us. This is a marvel of condescension, that the great Almighty should pour upon us His personal love and affection. If there are two noblemen, they respect one another. They are wealthy, they are peers; it is quite usual and expected. But if a nobleman of the royal house, of the royal blood, in his wealth and affluence were to pour out his love upon a poor, crippled peasant, and care for him, and love him, and comfort him, and encourage him, be surety for him, how wonderful, how magnificent! And yet that would be a small thing compared to the condescension of the Lord God of the heaven of heavens, who pours out His abounding love upon us; that the infinite should love the finite, that the holy and the pure should love the unlovely and the impure. It is a marvel of condescension. It is more marvelous still when we think that He loves us in our sin and in our human frailty. The Lord looks down upon us with compassion and pity and mercy. As He said in Ezekiel, "As I live, saith the Lord—as I live, I have no pleasure in the death of the wicked; but that the wicked turn from his way and live: turn ye, turn ye . . . for why will ye die?" [Ezekiel 33:11]. Why will you die when the crimson cross is so nearby, when the love of God is poured out without measure upon us in pity and compassion? God loves us, and He sent His Son to be an atoning sacrifice for our sins. Text, audio, and video for the full sermon, "The Love of God"